Rhoeo spathacea, or "Moses-in-the-Cradle," is a fleshy rhizomatous herb native to Mexico, with rosettes of waxy lance-shaped leaves. Leaves are dark to metallic green above, with glossy purple underneath. THese will reach up to 1 foot (30 cm) long by 3 inches (7.5 cm) wide. They are very attractive foliage plants that will reach 1 foot (30 cm) tall. They are hardy in USDA zones 9-12. Blooming Time: The small white flowers in boat-shaped bracts will bloom all year sporadically, with flushes of heavy blooming in the spring and fall. Culture: Rhoeo spathacea are easy to culture, only requiring a well-drained soil mix and full to partial sun or high interior lighting. In the greenhouse, we use a soil mix consisting of 1 part peat moss to 2 parts loam to 2 parts sand or perlite. The plants are well watered and allowed to dry slightly in-between waterings. During the spring and summer, they are fertilized monthly with a balanced fertilizer. During the winter months, the plants are allowed to dry thoroughly before water is applied again. No fertilizer is used during this time. Propagation: Rhoeo spathacea is propagated by division in the spring and fall or by seeds produced in the boat-shaped bracts. Seeds germinate in 14-60 days at 65-70° F (18-21° C). 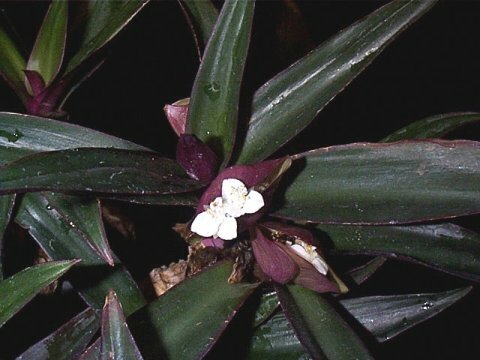 Rhoeo spathacea was featured as Plant of the Week February 20-26, 2004.